Both Pam and I were fortunate to have graduated from Nova Scotia College of Art and Design in Halifax, Nova Scotia (Pam has a BA in Ceramics and a BEd in Art Education, while I received a BA in Ceramics from Ohio Northern University and an MFA in Ceramics from NSCAD). While at NSCAD, in addition to gaining the obvious technical knowledge required to become potters, we gained perspective, seeing and studying pottery across cultures, from Neolithic times to the present. We have been shaped by early English slipware and the tradition of the commemorative plate, and by the strong forms and pattern of Eastern ceramics. “How To Wrap 5 Eggs: Traditional Japanese Packaging” was a major influence in my appreciation of form and function. The Arts and Crafts movement, and its idea that function does not preclude beauty, has also deeply informed our work. In art school, pottery was mostly an exercise. Once in our own studio, with our influences in place, we started to really learn about pottery by actually using what we made. How big should a bowl be? What is it for? These kinds of questions directed our approach. Using a local earthenware clay, and following some of our early influences, we began decorating exclusively with coloured clay slips and transparent glazes. 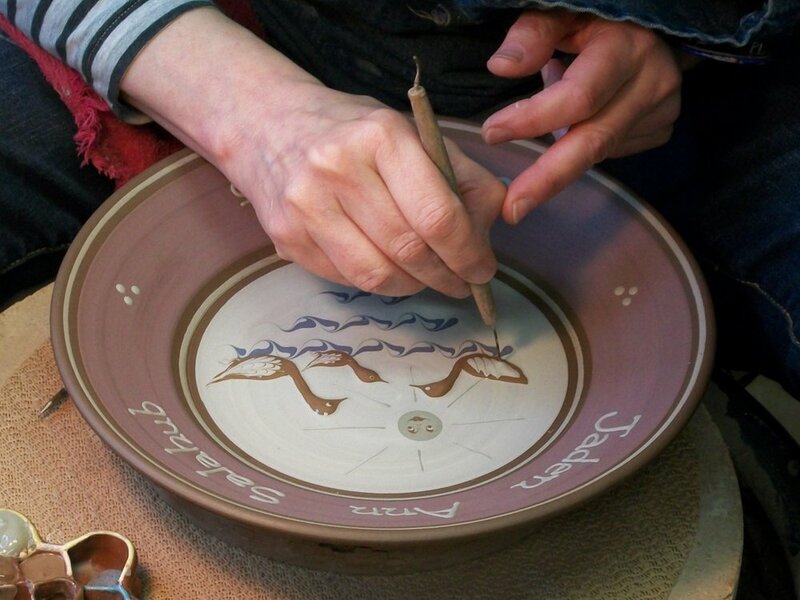 Slipware demands that you decorate the pottery before it has been fired, so there is a wonderful fluidity to the process that offers endless options for truly unique patterns. Having a retail gallery shop for 40 years provided us with great customer feedback and allowed us to spend more time on our pieces. We still love the problem solving involved in making a special order for a valued customer. To realize an idea in a three-dimensional object is a kind of magic. In this age of "instant everything", we see more and more people connecting with hand-made, well-crafted, considered pieces that embody the integrity of their maker. For over four decades, we have strived to make pieces that you never tire of—ones that can be a functional and beautiful part of your daily routine for years to come. 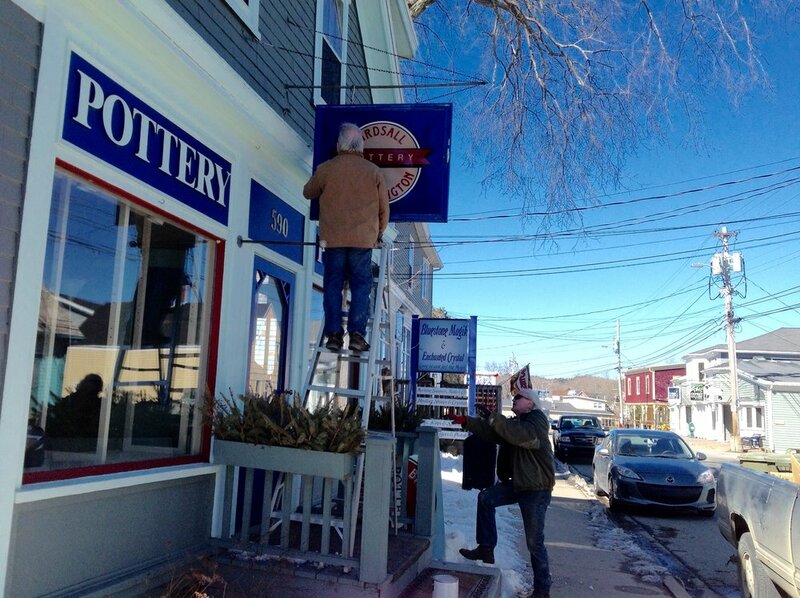 In 2018, we sold the building on Main Street, and with the help of friends and family, moved 40 years' worth of equipment, shelving, and assorted studio items into the new space. After much thought and planning, we rebuild the studio to be better and more efficient than ever. It is compact, but not claustrophobic—a pleasure to work in. In 1977, shortly after graduating from the Nova Scotia College of Art and Design, we set up our studio on Main Street in the beautiful seaside town of Mahone Bay. It proved to be a wonderful location, providing good sales and constant customer feedback. We made a wide variety of both functional and decorative pottery using clay from a local brick factory. We soon began to specialize in commemorative plates that marked the significant events in people's lives. 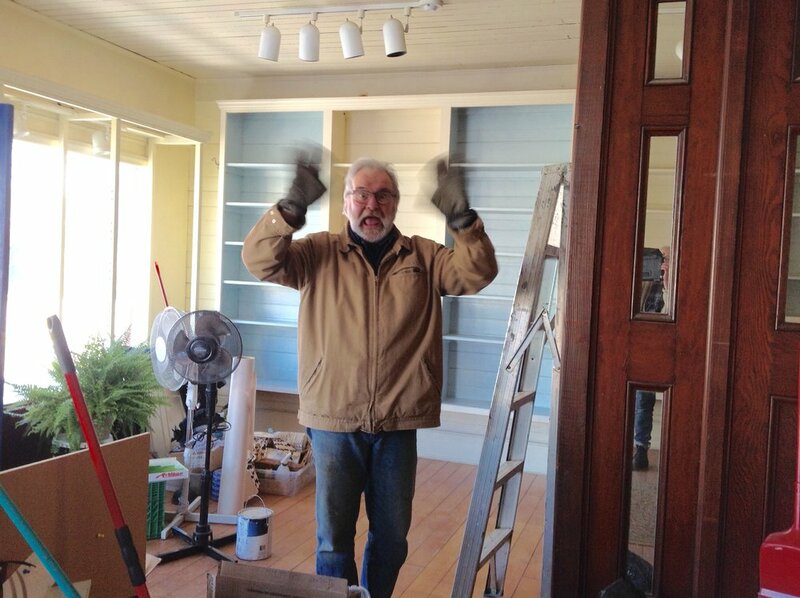 After 40 years of running the gallery shop and studio, we thought it was time for a change in direction. We had amassed a great customer base, so simply relocating our studio and selling online seemed like the natural next step. In 2018, we sold our building and moved our studio to the Mahone Bay Community Centre. This newfound ability to just come to the studio and focus on our work has been both creatively and professionally rejuvenating. We hope you will continue to follow our creative journey as we regularly add new pieces and features to the website.